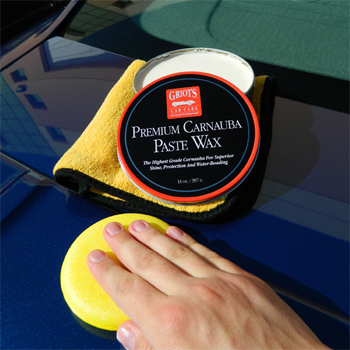 Home > Griots Garage Premium Carnauba Paste Wax 14 oz. Griot's highest grade carnauba wax! Griot's Garage Premium Carnauba Paste Wax uses the highest grade carnauba blended with the finest ingredients to create a wax that is easy to apply and produces incredible shine and protection for your paint. The old-fashioned paste wax in a tin has been reinvented! You'll love how your paint responds to Griot's Garage Premium Carnauba Paste Wax. Griot's Garage Premium Carnauba Paste Wax will make your paint feel like silk. Hydrophobic technology forms a "non-wettable" surface so the water beads actually curve into themselves for less surface contact. The surface is so smooth, the water just glides right off. A quick cure time means you can apply it and buff just minutes later. And, if you let it dry too long, just apply a little wax onto the dried wax and buff immediately. It's almost effortless! Apply Griot's Garage Premium Carnauba Paste Wax by hand or machine using Griot's Garage Red Foam Wax Pads and buff with a Griot's Garage Micro Fiber Wax Removal Cloth. The large 14 ounce tin makes it easy to apply wax to your pad and this amount will protect up to 14 vehicles. You'll love the bright shine, smooth paint and unmatched protection. Trust Griot's Garage Premium Carnauba Paste Wax to protect your prized possession.